Austria's Oscar submission is an elegiac look at literary exile. Like a continental “Goodbye to All That,” Maria Schrader’s “Stefan Zweig: Farewell to Europe” is an elegiac look at literary exile. Zweig, a German Jew who saw the writing on the wall when Hitler ascended to power, espoused peaceful ideals that were increasingly at odds with reality; the world benefited from his presence, but he struggled to find his place in it. Schrader and actor Josef Hader honor that alienation while also spotlighting moments of bliss throughout Zweig’s later years. “Farewell to Europe” is likewise concerned with time. Broken into chapters and taking place over the course of six years beginning in 1936, its episodic structure elides most of the biographical details that bog down similar films. 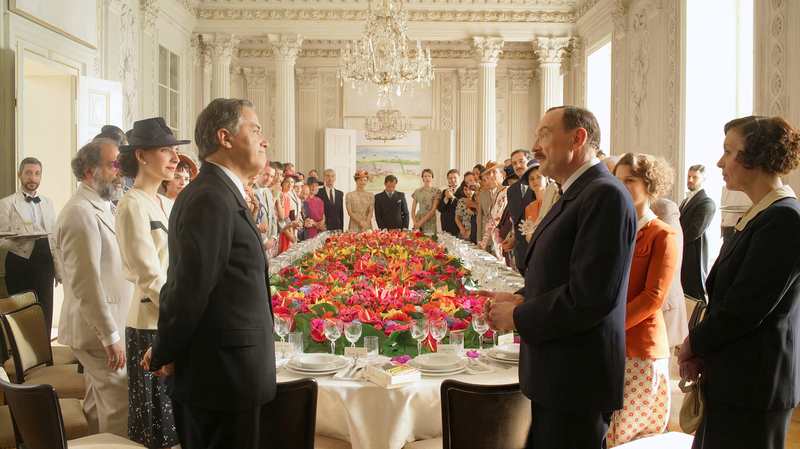 Its opening scene, a soiree celebrating Zweig’s arrival in Brazil, takes place in a grand dining room with all-white furnishings offset by the vivid floral arrangement at its center; the camera stays put during the extended sequence, but Schrader and cinematographer Wolfgang Thaler keep our eyes moving. That color contrast recurs throughout the film, a fitting representation of Zweig’s reserved background giving way to his bold new surroundings. “Your works arrived here long before you,” a Brazilian emissary tells the acclaimed author, and it’s true: Zweig amassed an international reputation that made him welcome in other countries even (and perhaps especially) when he was no longer allowed to publish in the fatherland. He sees in Brazil an answer to what he considers the most pressing question there is: how to coexist despite our many differences. Lord knows they’d yet to figure it out in Europe. That brings the writer a modicum of peace, and yet he can’t help but be troubled by what’s going on back home. Though he avoids explicitly condemning recent developments in Germany — he argues that to do so from the other side of the world, where he’s neither up to date nor directly affected by it, would be perverse — we see it wearing on him. Hader carries this burden quietly, like he knows Zweig would rather write about it than speak it aloud. Schrader’s direction is unobtrusive but agile, as though she considers it her duty to provide a cinematic soapbox for Zweig and politely exit the spotlight. (Perhaps unsurprising for an actress-turned-filmmaker.) Not that there aren’t flourishes along the way: One brief scene has us gazing through the same snow-covered window as Zweig, looking at the wintry street below; not much happens, but there’s a quiet thrill to the snow-globe effect of watching people go about their business from the other side of the glass. That effect is present throughout “Farewell to Europe,” which is stately and reserved but occasionally distancing as well. Schrader keenly observes her subject’s intellect, but we have to read too far between the lines to earn a sense of his emotional inner world. This is nevertheless a rare example of a biopic that gives the sense of a life lived while also bucking some of the genre’s more stifling trends. Every farewell is also a hello, except for the last one.